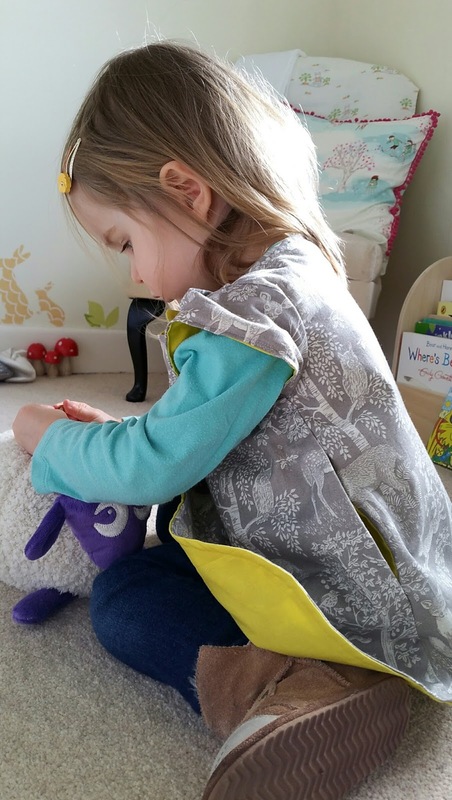 The Sewing Tree: Toddler Tunic! I've come across so many gorgeous patterns for little girls on my sewing travels, some of which I have made for my daughter as a baby and now as an active toddler. There are some very pretty and sweet dress patterns that can be complimented with the array of fabulous fabrics on the market. However, the quest for something practical, functional, yet still girly and cute, took me away from commercial patterns and into the world of online pdf patterns, created by fellow sewing enthusiasts and that they've been kind enough to share with the world of sewers and makers. This method does mean printing out the pattern yourself and piecing together a paper jigsaw of A4 print outs, before cutting out your pattern in the usual way. I don't object to this however and more of the commercial pattern companies are offering the choice of a digital version instead of a printed pattern for those who prefer it. 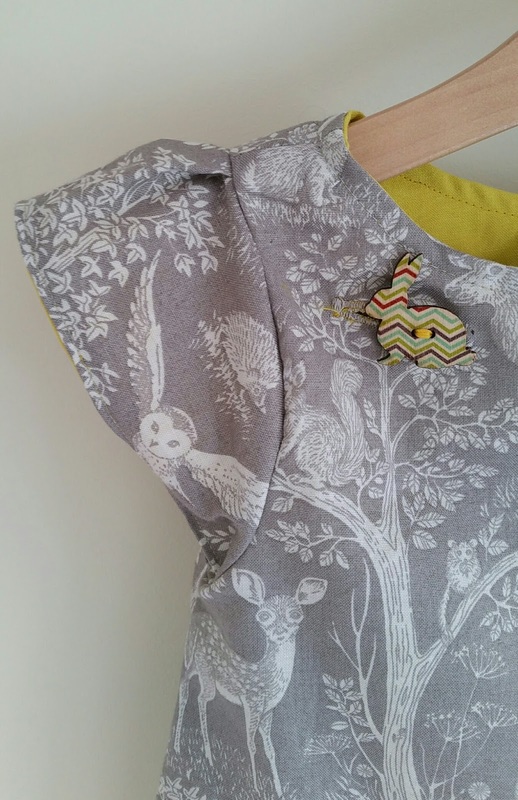 You can also choose what paper you use to print on, which can be a welcome alternative to flyaway tissue patterns that easily tear after bring pinned to fabric a few times. 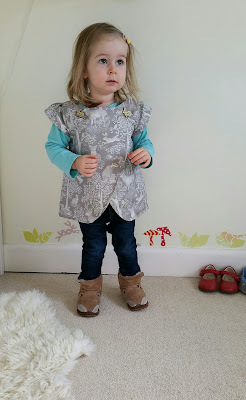 This wrap over tunic top caught my eye and I could visualise my busy little one in it instantly. It even has useful pockets (pron. ''bobbits'') for useful girly stuff...and you never know what you'll find in a pocket if you delve deep enough! 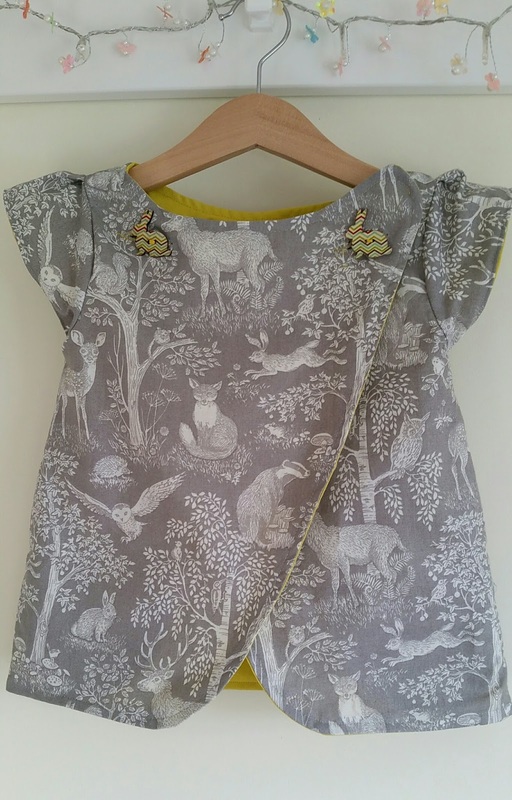 It can be made as a completely reversible tunic and the wrap over design means that you always get a peek of whichever fabric is on the inside, so I chose a strong yellow to contrast with this beautiful grey, woodland animals design. I also used the yellow for the inseam pockets so you get another little flash of contrast there. 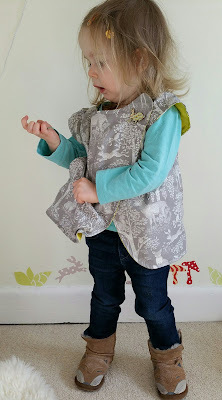 Although the pattern itself is very simple, without as much of the direction you'd expect from a commercial pattern, (for example there were no placement markings for the buttonholes), it is a very workable pattern that yielded great results. With several versions and makes of it out there on the web, it is lovely to see what other people have done with it too. 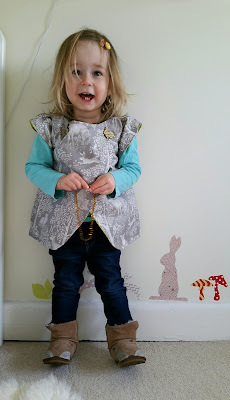 It is definitely one of my favourite and most satisfying creations to date in terms of wearability, fit and structure and I just love it on her ! I'm on to my next one already !